Recently, on my vacation to the US, I bought a trash can. Yes, a trash can. Did I need it? No, not really. But it was cute, it was from Target, and it was only $3, so I bought it for my classroom. I don't know about you, but that last sentence has come out of my mouth a lot over the four years that I've been teaching. And somehow, in those four years, I've managed to accumulate a lot of stuff. By now, if you're a teacher reading this, you're probably trying to rationalize. 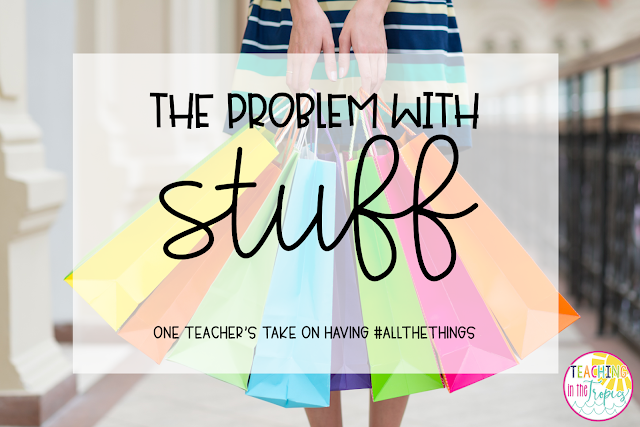 "But buying stuff comes with the territory when you're a teacher," you might say. "It's different from any other job." And I agree. However, I am realizing that my "stuff" problem doesn't just show up in my classroom; it's in my home too. It's in my closet, in my drawers, on my desk. Everywhere I look, there's so. much. stuff. I'm realizing that the problem with stuff is that you always want more. As a teacher or just as a human being, I may think that is perfectly fine. But as a Christian, I know better. I know that there's more to life than having more. God has been using this verse over the past year to remind me that all these things, these earthly treasures if you will, are temporary. He's been teaching me that putting my hope in something temporary will always lead to disappointment. Temporary things can never bring permanent joy and fulfillment. Only Christ can do that in our lives. "Jesus said to them, 'I am the bread of life; whoever comes to me shall not hunger, and whoever believes in me shall never thirst.'" Sadly, we live in a world that tries to convince us otherwise. Everywhere we look - especially on social media - we're bombarded with the message that we need to have #allthethings in order to be happy and successful. And we get the idea that if we don't have the same things as everyone else, we're missing out. This message has trickled into the teaching community over the last few years, and many teachers - myself included - have fallen into the trap. In 1 Timothy 6:17, we are told "not to be arrogant nor to put [our] hope in wealth, which is so uncertain, but to put [our] hope in God, who richly provides us with everything for our enjoyment." I love the last part of that verse because it reminds me that God doesn't want us to not have money or nice things. In fact, He's provided us with things for our enjoyment. In the Old Testament, we're told that God blessed King Solomon with more wealth than any other king (1 Kings 3:13). God is not opposed to wealth and possessions. What He is opposed to is the attitude of dependence and greed that we often develop towards wealth and possessions. Instead of owning possessions, our possessions end up owning us. Even Solomon, who was arguably the richest man who ever lived, concluded that riches and possessions are ultimately meaningless. "Whoever loves money never has enough; whoever loves wealth is never satisfied with their income. This too is meaningless." When I finally made it home from my vacation on Thursday night, I unzipped my suitcase and took out that trash can that had looked so enticing in the Dollar Spot just a few days earlier. It had made it through the journey, albeit with a new dent or two. I had stuffed some clothes inside of it to take up space and hopefully offer some protection, but I guess my plan hadn't worked as well as I'd hoped. After I removed each crumpled piece of clothing, I looked at the trash can - a little banged up and totally empty. The thought came to my mind that my life is often a lot like that trash can. To maintain appearances, I fill it with things that seem to offer security and protection, but just end up leaving me bruised and empty. 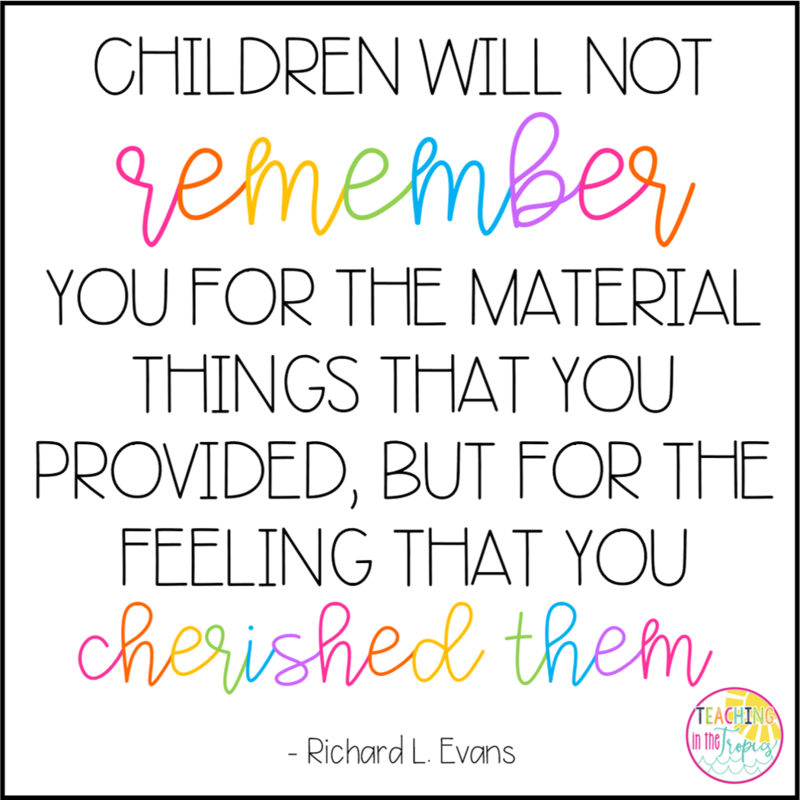 "Children will not remember you for the material things that you provided, but for the feeling that you cherished them." 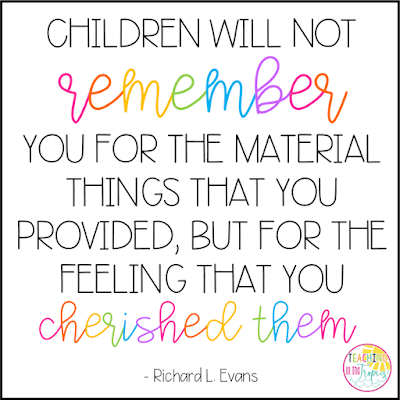 It's easy for me to forget that although my students enjoy having a nice classroom with cool rewards and incentives, what they really yearn for is my love. This year, I want to invest in my class more than my classroom. I want to give these precious children my time, energy, grace, and love above all else. I want to show them the "great love [my] Father has lavished on [me]" (1 John 3:1) so that they will know more than anything that they are loved and cherished. Because that's what it's all about, isn't it? Not #allthethings, but #allthelove. As I prepare to start the new school year in the next couple of weeks, I invite you to pray with me for our students and each other. To pray that our hearts will be focused on what's most important and that love and grace would be our top priority in our classrooms this year. "'A new command I give you: Love one another. As I have loved you, so you must love one another. By this everyone will know that you are my disciples, if you love one another.'"